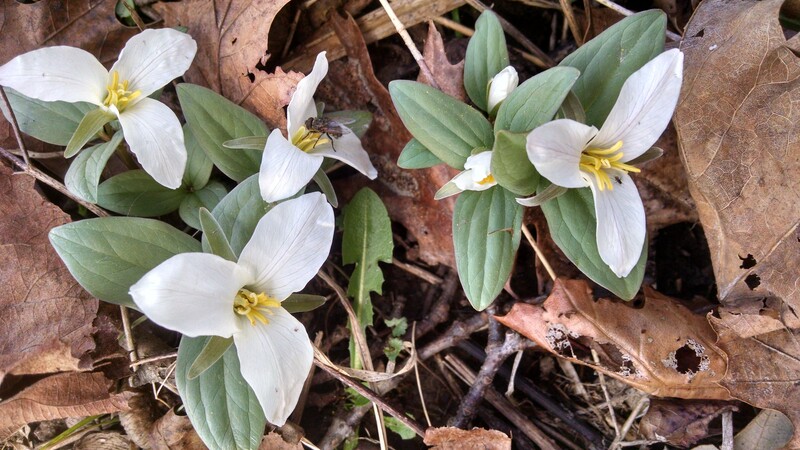 The spring wildflowers are in their second flush, as the wild plums and bloodroot are nearly finished blooming. 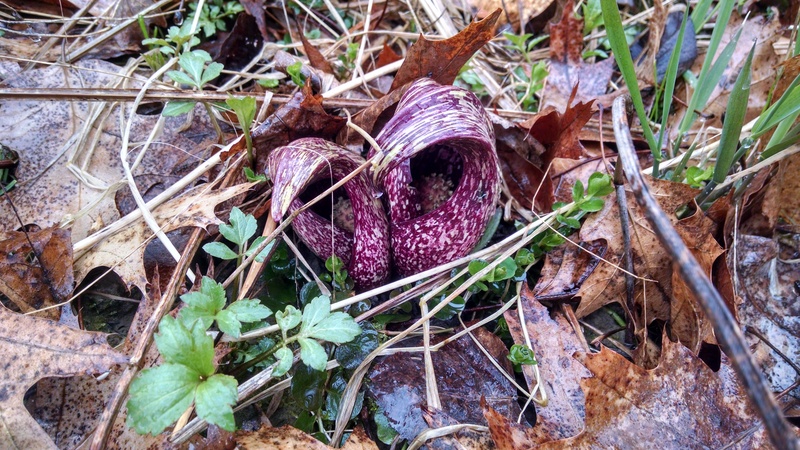 The warm weather has brought new hues to the forest, in a crescendo of vibrant colors. 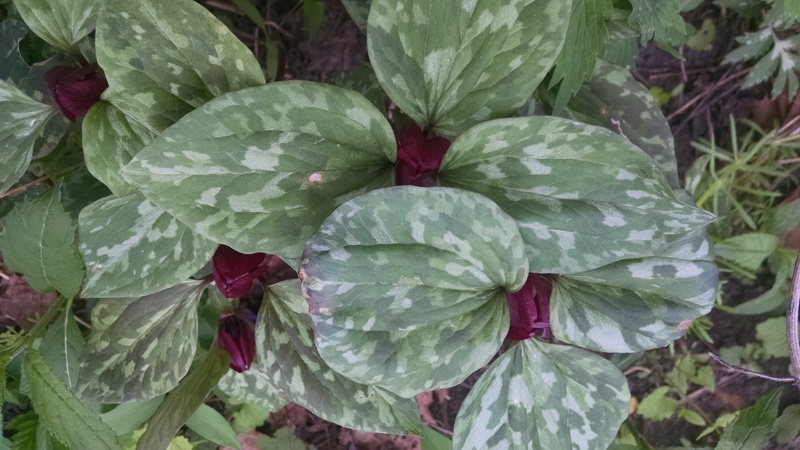 Trillium are in full bloom, adding a deep red to the woodland forest. 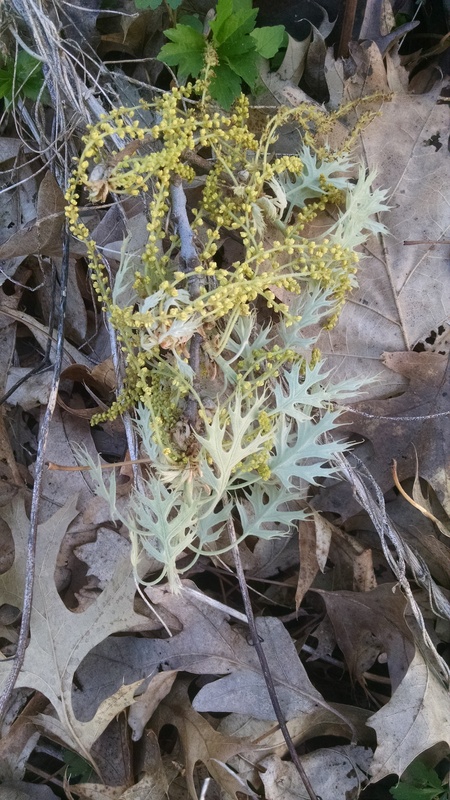 The red oaks rely on wind for pollination, so their pollen is usually viewed as a radiating golden hue in the tree tops. This small branch was brought down in the wind, allowing me to admire the rich color and delicate leaves more closely. 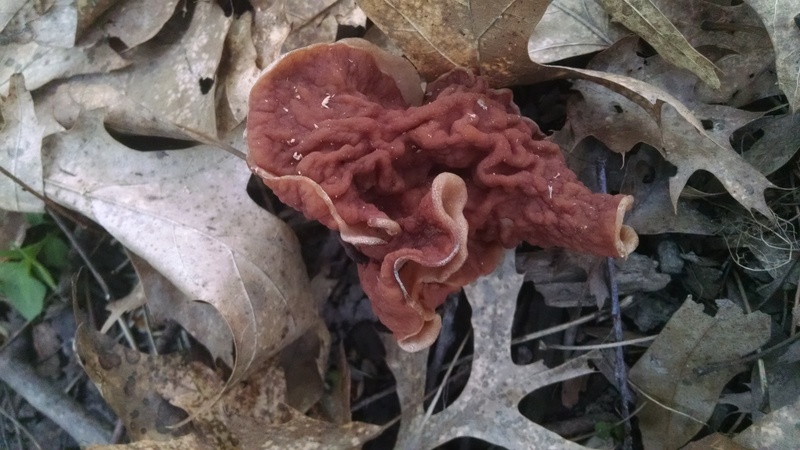 No true morels, yet. But we found a large patch of these rusty-eared gnarly beauties, with their untraceable folds and delicate ripples. 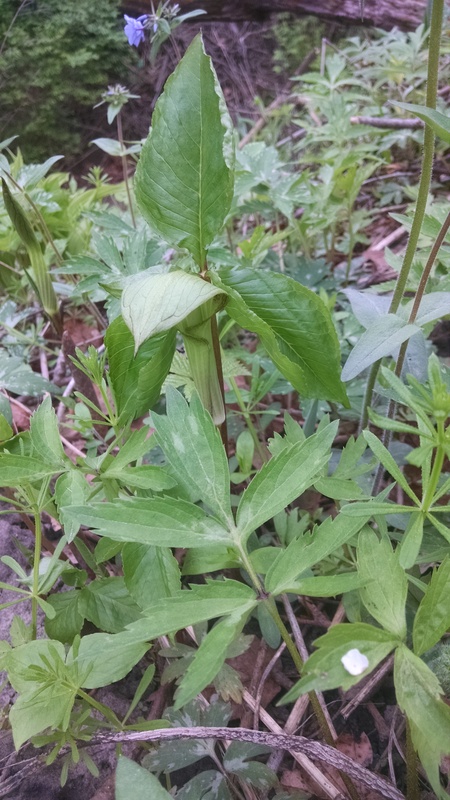 The jack in the pulpit’s green on green provides subtle grace and requires a careful look, before the show-stopping red berries in the fall..
Bellworts add their bright yellow to the edge of the woodland. An apiary must be more than a wooden box in an ecological desert. The honeybee is imperiled not because we cannot make enough wooden boxes to house them in but because we are all too prolific at creating and maintaining ecological deserts. From the corn field in which we are unwilling to share space for milkweeds, to the Kentucky bluegrass lawn in which we are unwilling to share space for clovers, our meticulously maintained monocultures create the ecological desert that cannot support bees and most other creatures. Save the bees, and we will be well on our way to sustaining the ecology of our planet. 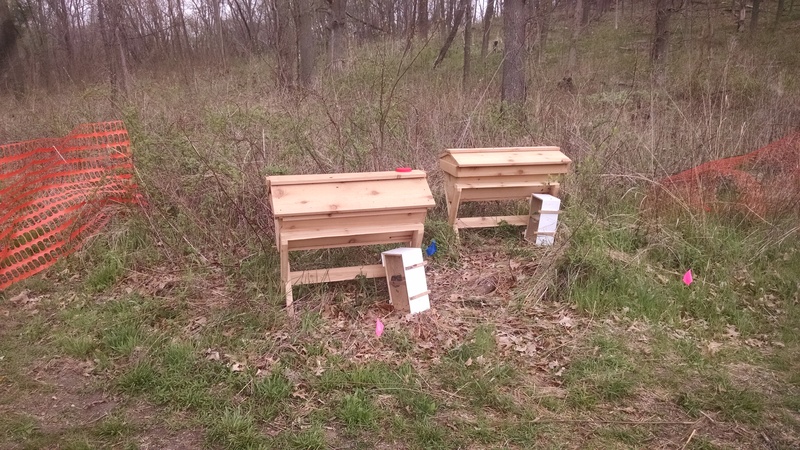 These cedar top-bar style bee hives will ensure good pollination of the trees and plants. And honey! 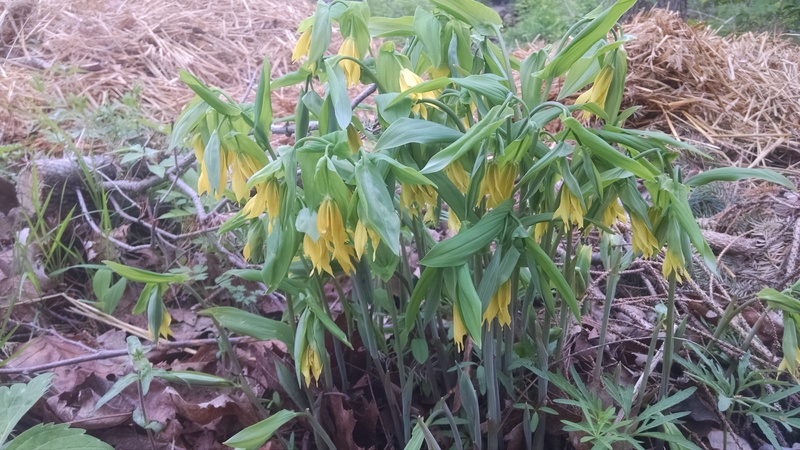 For this earth day, I have the rare opportunity to celebrate our ecology and life by dynamically increasing the diversity of Indian Creek Nature Center-a place that has incrementally been making such positive changes since it started in 1973. The bare ground from the Amazing Space construction zone is ours to create a new sustainable ecology for both the wildlife and the people. 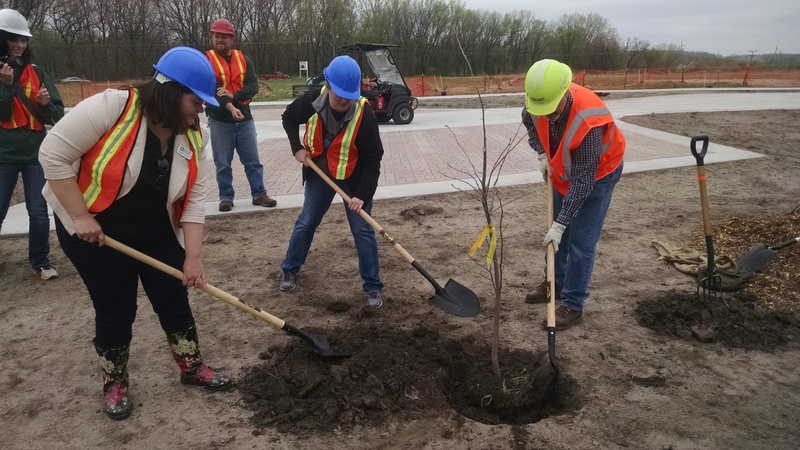 Alliant Energy employees volunteer to plant trees. The Lindens will be the dominant shade-producing trees for the driveway. Relationship to place. All of the species selected are native to Iowa. This recognizes and celebrates the value of the natural ecology. Having evolved here, the species will be self-sustaining, able to handle Iowa’s harsh winters and summer droughts. They will support the wildlife that lives here. Relationship to people. From the linden trees that will shade the driveway to the New Jersey tea plants that border the walkways, the plants and trees are species well suited for urban landscaping. They were selected to demonstrate how native plants and trees can enrich yards, providing beauty, shade and pollination. They also have edible nuts, flowers, and fruits, creating a multilayered edible landscape. Relationship to plants. Nature is a mosaic of diverse vertical layers. 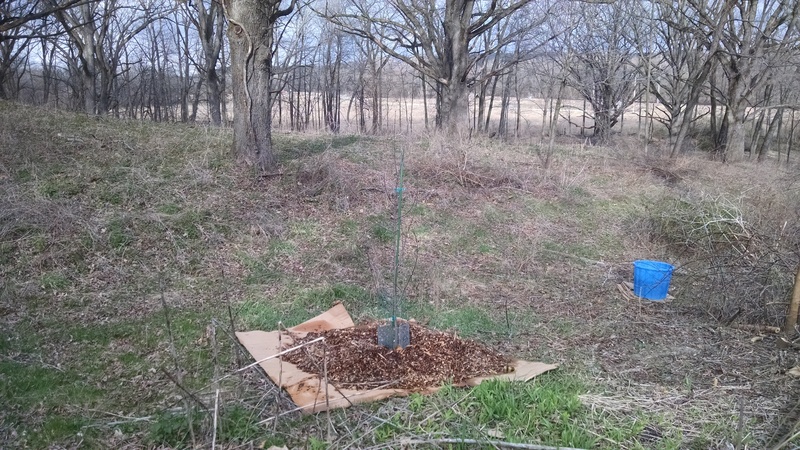 The lindens will provide some shade for the sassafras and bladdernuts. Sunny areas will be dominated tallgrass prairie species. Taller plants will rely on shorter plants for support. 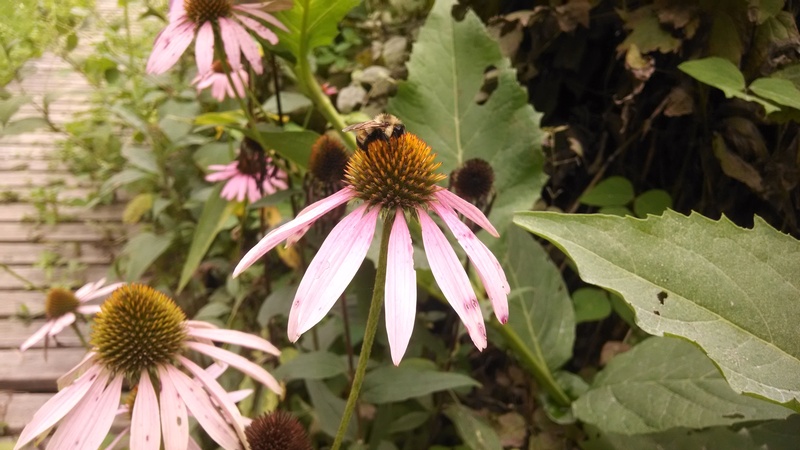 The flowers of a native landscaping plan support bumblees, butterflies and hummingbirds. When I was nine, my grandfather would let me mow the hayfield with the tractor. He would supervise from the edge of the field, wearing a long-sleeved plaid shirt and straw hat, eating an apple fresh from the tree. 31 years later, I wear long-sleeved plaid shirts and a straw hat to protect me from mosquitos, thorns, ticks, and the sun. I inherited a McCormick Farmall Cub tractor older than I am. The only thing missing was the apple tree. My friend Craig has been trying to give me a pair of apple trees for about two years now. I have always demurred, because apples need sun, and that’s not something I have a lot of living under the canopy of an oak savanna. 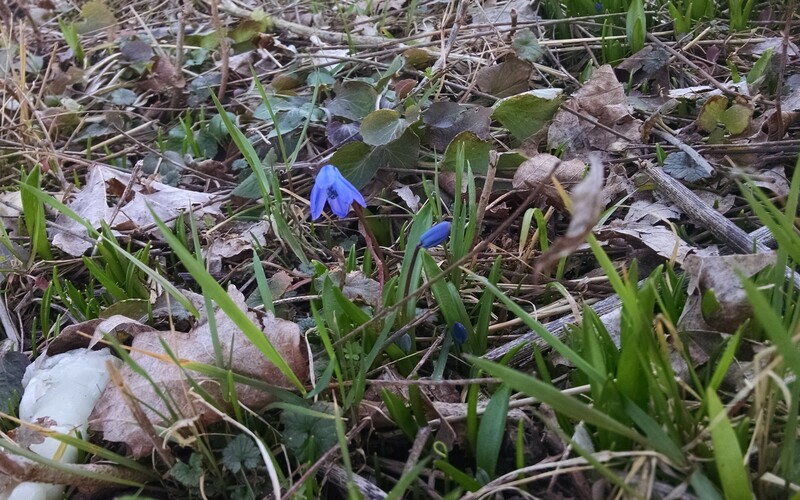 But this spring I was watching the cardinals and chickadees in the thicket of mulberries, multiflora rose, and honeysuckle that had grown up under the dead oak tree, and I realized that I do, indeed, have a sun spot. The oak tree died back in 2000, before we moved onto the land. It is gradually crumbling in place. Woodpeckers are aiding its decomposition, and more small twigs and bark slough off each year. If enough sunlight in the area is allowing the birds to plant and grow a thriving orchard of invasive trees and shrubs, its enough sunlight for a few more desirable trees as well. Armed with a chainsaw and a shovel, I started clearing and planting. Since I had no idea what kind of apple tree I wanted (the kind that tastes good? ), Craig started me with a lovely variety of heirloom eating apples: a Chestnut Crab, a Yellow Hardin, a Golden Russet, a Ribston Pippin, a Rhode Island Greening, and a Yates. 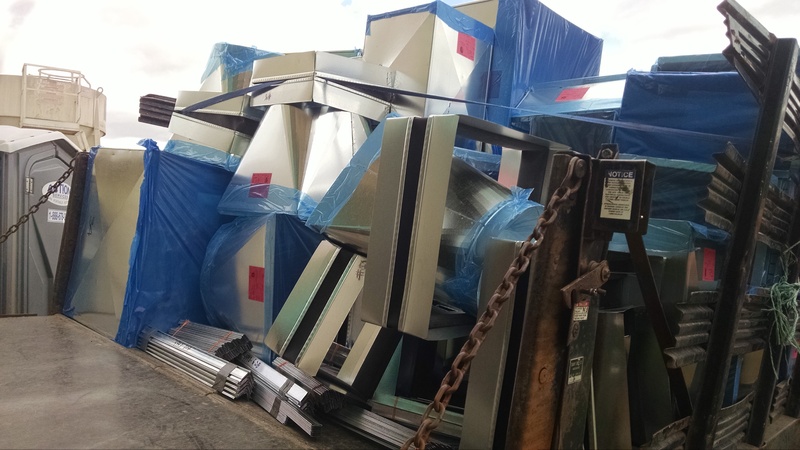 More ductwork arrives regularly. 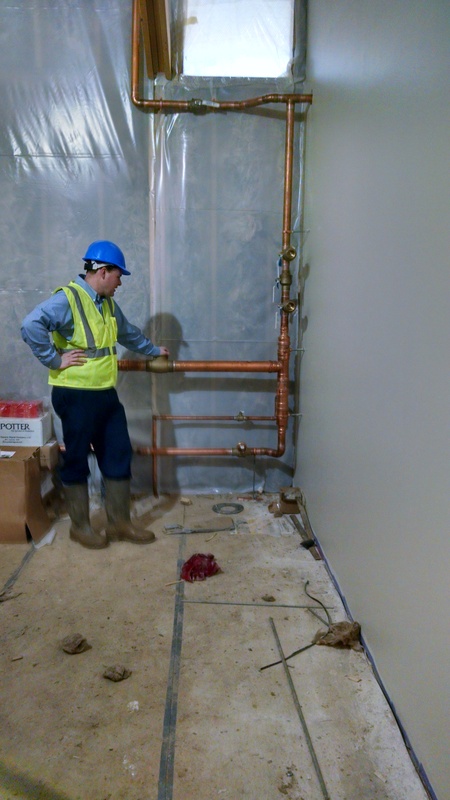 Often, ductwork inside a building is hidden above drop ceilings. In Amazing Space, we are deliberately leaving the ducts exposed. This helps guests understand the heating and cooling systems in the building, and allows us to highlight the natural beauty of the pine trusses and the integrity of the architectural design. 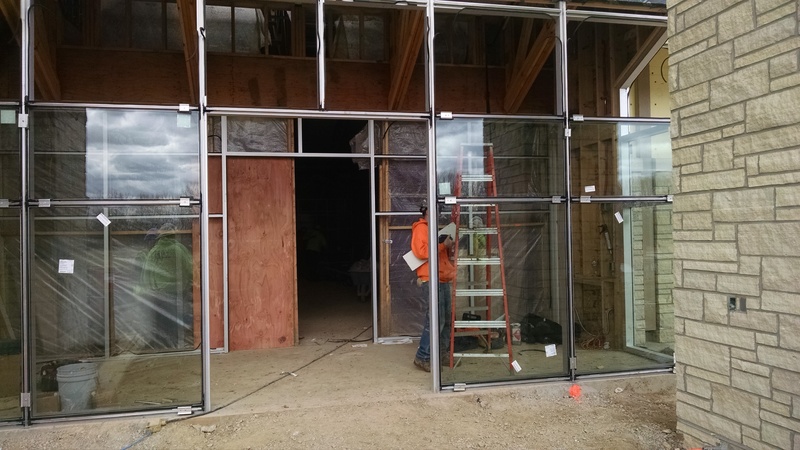 The glass walls and doors that invite people into the building and entice them back outside are being installed. With the exterior stonework finished and windows letting natural light inside, the biophilic beauty of the building is starting to emerge. 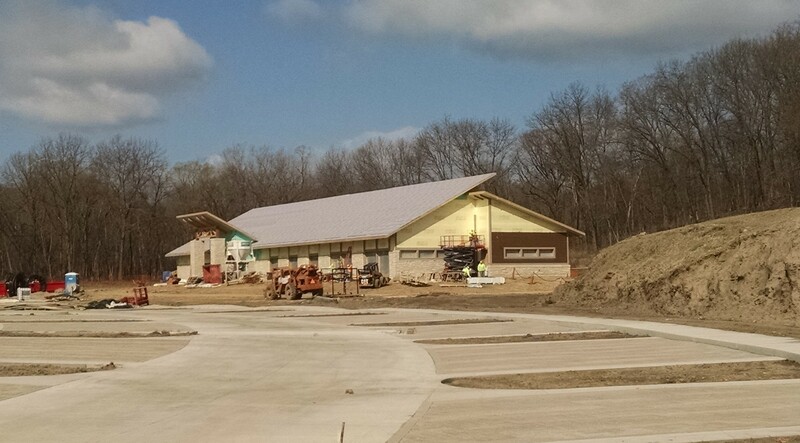 At same time the glass curtainwall system is being erected, the siding is being installed. The yellow insulation foam is being covered by the rich brown of the hardieplank panels. Amazing Space is made of locally sourced wood and stone. Initially, lapped cedar seemed like a logical choice of siding to compliment the stone. Despite being a rot-resistant wood, cedar still follows a natural decomposition path over time. The cedar on our existing building is being destroyed by woodpeckers, as they dig out the insect larvae burrowing in the wood. In contrast, the hardieplank siding is made from cement board, has a 30 year warranty, and will last indefinitely. The longevity and low-maintenance of this material weighed heavily in its favor as being the more sustainable option. 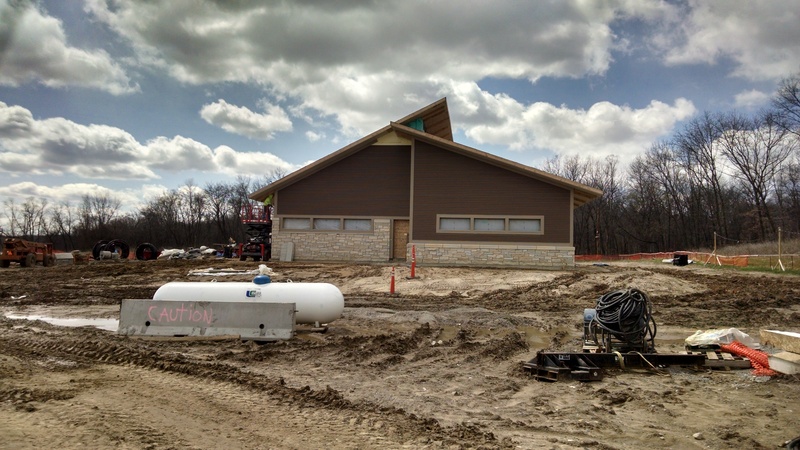 Being involved with a Nature Center is about creating spaces and opportunities for people and nature to come together. People understand and relate to the glory of being outside on a summer day full of birds, butterflies, and flowers. But the dynamics of what is happening behind the scenes and underground, the natural systems and processes that ultimately create that precious beauty, those stories are harder to see, understand and tell. To start with, plant roots (for example) are deep, big, and completely underground. Before the invention of the plow, people cut trees and planted crops and gardens in the forest soil because there wasn’t the solid mats of prairie roots to cut though. 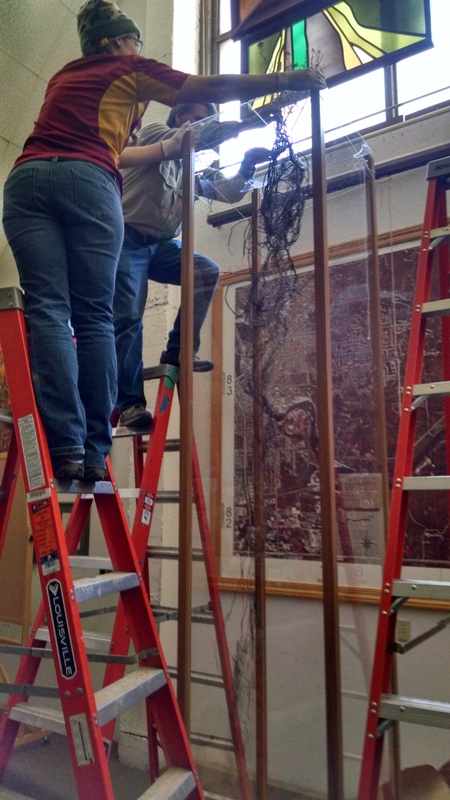 The Tallgrass Prairie Center recently gifted us with a real wild rose root. 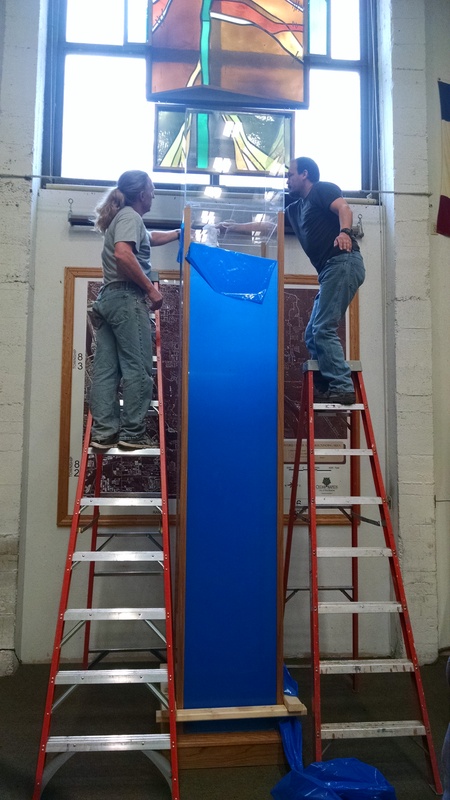 Displaying it required a 10′ tall case. In the wild, the roots go deeper. Fortunately for display purposes, the Tallgrass Prairie Center grows the native plants for three years in a 10′ tube, giving us a “manageable” root to work with. I only said, “we’re going to need a bigger ladder” twice. Before giving us the root, the Tallgrass Prairie Center soaked it in a solution of glycerine, acetone, and ethanol to preserve it. 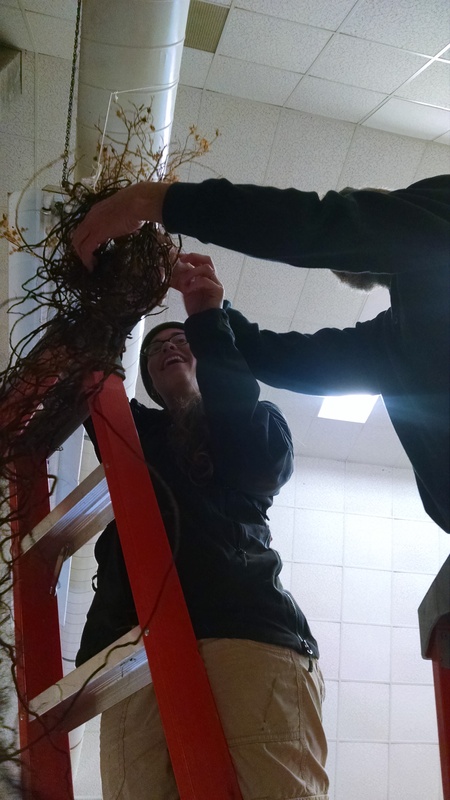 The first step in displaying the rose root was to tease apart the root fibers after storage, so they would hang naturally. While the glycerine solution preserves the root against decomposition, it was still very fragile and bits of the finer hairs would fall off over time. 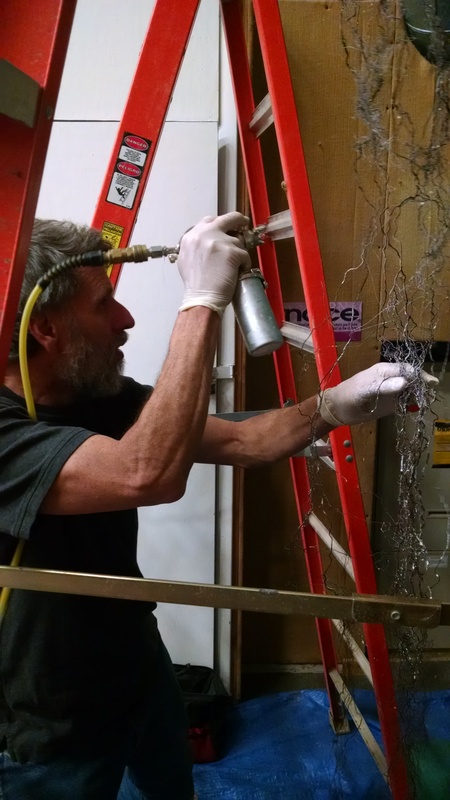 Terry Brown, owner of Museum Professionals, donated a day of his time to preserve the root, forming it into a natural shape and then spraying it with a stabilizing solution. He then helped us install it in the display case. In a few short months, the root will be joining us in Amazing Space to form the centerpiece of our tallgrass prairie exhibition. 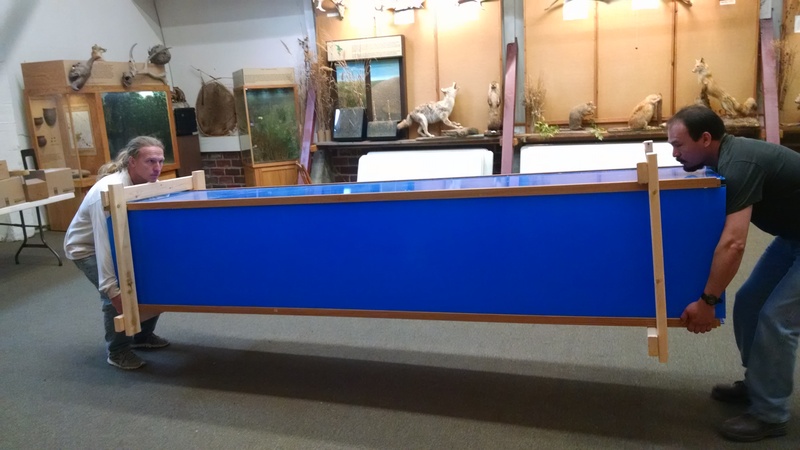 If you want a sneak peak, it is on display in the Nature Center’s existing auditorium. The sustainability of a building really comes down to a snug, well-designed envelope. The walls, windows, doors, roof and floor are what prevent cold air from escaping the building in the summer and warm air from escaping the building in the winter. A good envelope has a high thermal resistance, or R-value. This equals sustained low energy usage and low energy bills. 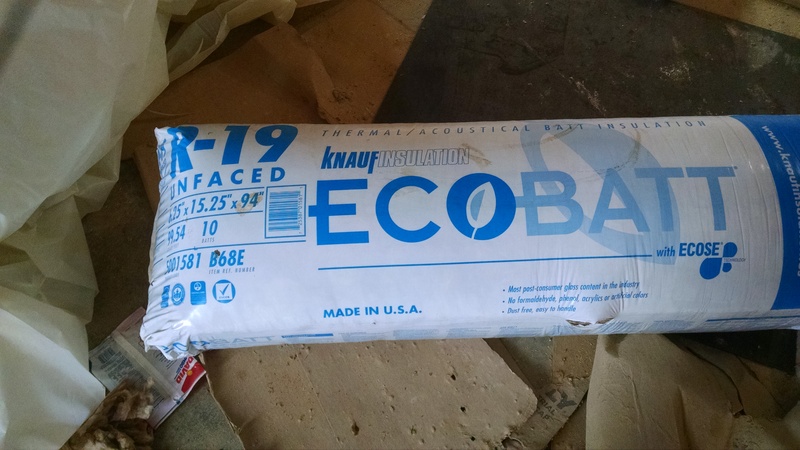 Ecobatts are an environmentally friendly replacement to traditional fiberglass insulation. With an R-19 value, they are part of the Amazing Space wall system that, when fully assembled, will provide a snug R-30 building envelope. The bats are made of sand and recycled bottle glass that form a glass mineral wool. The mottled brown color reflects their undyed, natural origins. Even the binder is a renewable, bio-based material that is petroleum and formaldehyde-free. 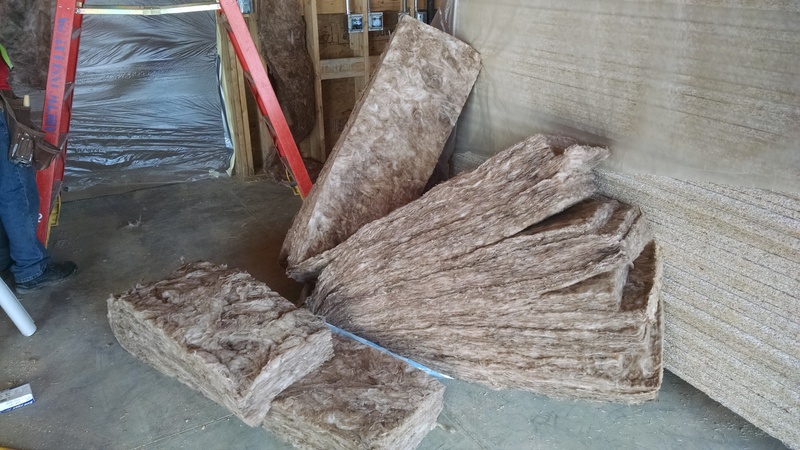 On the interior of the walls, plastic is used before the sheet rock is installed to create a moisture barrier between the exterior wall and the interior of the building. 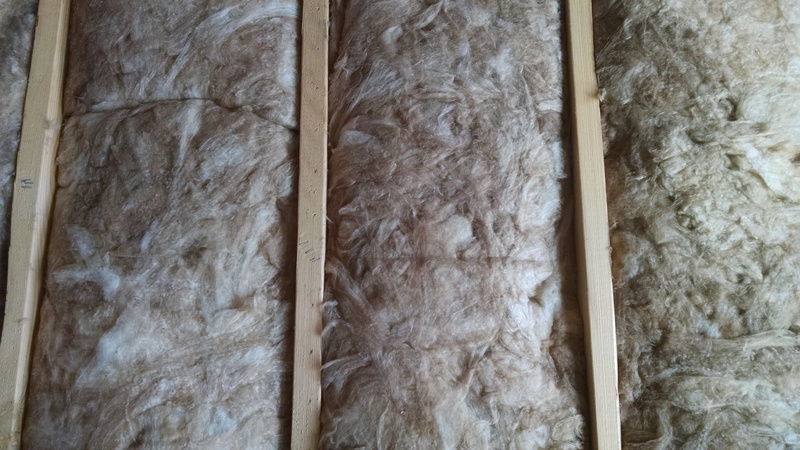 The insulation is naturally mold-resistant and water doesn’t hurt it. The walls are designed to be water-proof, but anything can happen over time. Proactively designing a wall system with strong integrity against the elements is designing a building with a long life-span that is easy and economical to maintain.